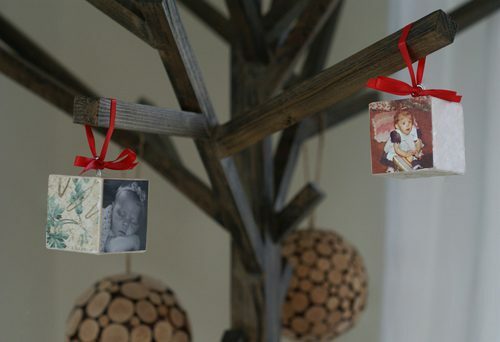 These photo block ornaments are really very simple, but the final result is an ornament that would make a special gift or keepsake. I love how these turned out and hope to make some more of them in the coming months! I used vintage-y scrapbook paper on my blocks, along with a picture of one of my early Christmases on one of the ornaments, but you could make a variety of themes: baby pinks, blues, greens and yellows for Baby’s 1st Christmas, traditional red and green with a Christmas photo, silver foil papers with a black and white photo, etc. Cut out 2″ squares from your scrapbook paper. You’ll need 5 pieces in a variety of designs for each block. Use a thin layer of ModPodge to glue the paper to the sides of the blocks. Let dry overnight. Lightly sand the edges of each side of the block to give the paper a worn, imperfect look. 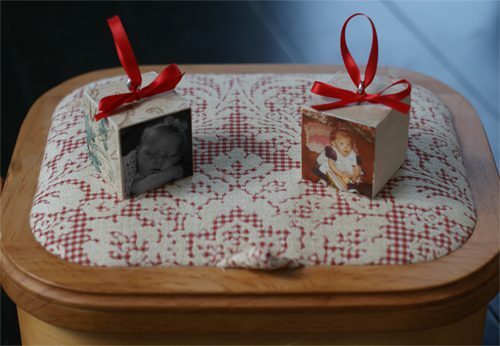 Cut out a 2″ square photo for each block. Use a thin layer of ModPodge to attach it. Let dry. Screw an eye bolt into the top of the block and tie a ribbon around the eye. Where can I buy the wooden blocks? Hi Helen! You should be able to find them at any craft store, or even online at JoAnn Fabrics, Michael’s, etc.